Secretary of State Rex Tillerson said Friday that U.S. diplomats in Havana had been the victims of “health attacks” that left them with hearing loss — the most definitive U.S. statement yet on a series of mysterious incidents that have puzzled longtime observers of U.S.-Cuban relations. His comments came two days after the State Department issued a vaguely worded statement saying there had been “incidents which have caused a variety of physical symptoms.” U.S. officials later revealed that American diplomats had suffered unexplained losses of hearing, and on Thursday Canada’s government said at least one Canadian diplomat in Cuba also had been treated for hearing loss. “We hold the Cuban authorities responsible for finding out who is carrying out these health attacks on not just our diplomats but, as you’ve seen now, there are other cases with other diplomats involved,” Tillerson said in Bedminster, N.J., where President Donald Trump and members of his administration spoke to reporters. In the fall of 2016, a series of U.S. diplomats began suffering unexplained losses of hearing, according to officials with knowledge of the case. Some of the diplomats’ symptoms were so severe that they were forced to cancel their tours early and return to the United States, the officials said. The officials told The Associated Press that the hearing loss appeared to have been caused by the deliberate use of some sort of sonic device operating outside the range of audible sound. Former diplomats and students of U.S.-Cuba relations said they found it inexplicable that Cuba would have tried to harm U.S. and Canadian diplomats, particularly in the fall of 2016 as President Barack Obama was ending a second term marked partly by the reopening of diplomatic relations with the island. U.S. officials familiar with the incidents said they began to be reported last October, when most domestic and foreign observers expected Hillary Clinton to win the presidency and continue Obama’s policy of normalization with Cuba. Attacking Canadian diplomats would be an inexplicable assault on one of Cuba’s most important trading partners and the largest source of tourists to the island. Former U.S. and Canadian diplomats said they had been targets of low-level harassment and intimidation by Cuban agents in the 1980s, 1990s and 2000s, incidents that included attacks on diplomats’ pets and intimidating maneuvers like tailgating and flashing bright lights into diplomats’ cars as they drove with their families late at night. 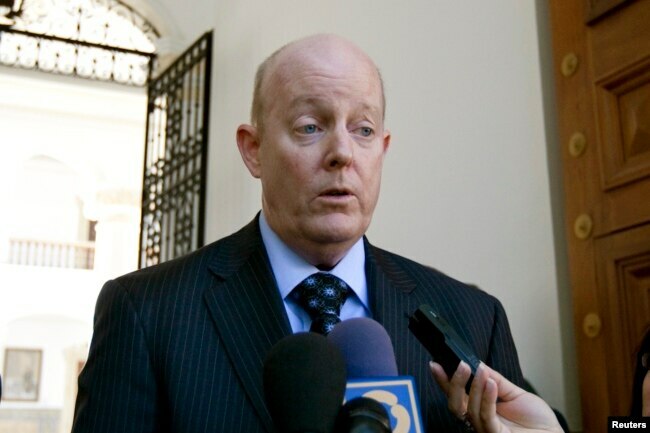 FILE – U.S. diplomat John Caulfield is pictured in Caracas, Jan. 11, 2010. Caulfield, the head of the U.S. Interests Section in Cuba from 2011 to 2014, is one of several former U.S. and Canadian diplomats who said they had been targets of low-level harassment and intimidation by Cuban agents in the 1980s, 1990s and 2000s. “There were things like turning off your electricity, turning off your water, entering your home, leaving little reminders that they were there. Things would be out of place,” said John Caulfield, the head of the U.S. Interests Section in Cuba from 2011 to 2014. In addition to harassment, Caulfield said, U.S. diplomats in Cuba are under 24-hour surveillance during their assignments. “Nobody does anything in Cuba without them knowing,” Caulfield said. A U.S. official said some American diplomats in Cuba had come home to find that someone had used their toilet and not flushed it, in what was interpreted as a deliberate attempt to disgust and unnerve. The official served at the then-interests section in Cuba in the 2000s and agreed to speak only on condition of anonymity because of the possibility of a return to Havana. “All employees are fully aware that host government hostility extends to an elaborate, aggressive intelligence apparatus,” the report said. Caulfield said aggressive tactics largely stopped by late 2013 and 2014 as U.S. and Cuban officials secretly negotiated the diplomatic reopening announced in December 2014, after his departure from Havana. A former Canadian ambassador to Cuba, James Bartleman, said that during his 1981-83 tour in Havana, he and his staff were targets of a string of mysterious attacks. He said the Cuban government sent a veterinarian to his house, but he sent his dog back to Canada, where it died six months later.